Product prices and availability are accurate as of 2019-04-19 00:00:08 UTC and are subject to change. Any price and availability information displayed on http://www.amazon.com/ at the time of purchase will apply to the purchase of this product. THE HIGHEST QUALITY: Contains the Pure Essential Oils of: Eucalyptus, Pine, Peppermint, Lavender, Spruce, Marjoram and Cypress. 100% PURE, UNDILUTED ESSENTIAL OIL SYNERGY:100% Certified Pure Therapeutic Grade Essential Oil- No fillers, additives, bases or carriers added. EASY TO USE: Place 5 drops in a large bowl of water that is hot (not boiling) and inhale for 5 minutes. *This method is not safe for children. * Alternatively, mix at a 5% dilution in a carrier oil or balm and use as a chest rub. BREATHE EASY: Respir Aid was created to support the respiratory system by blending together only the highest quality of pure, undiluted essential oils to help you breathe easier. HAVE QUESTIONS? 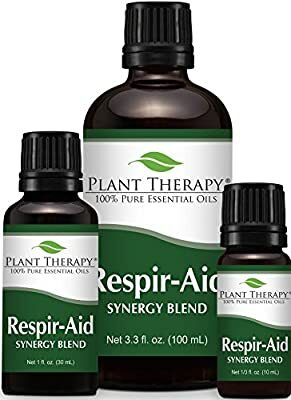 Plant Therapy's certified aromatherapists are happy to help you with your Respir Aid Synergy questions via Amazon Messages. We welcome your questions and input!